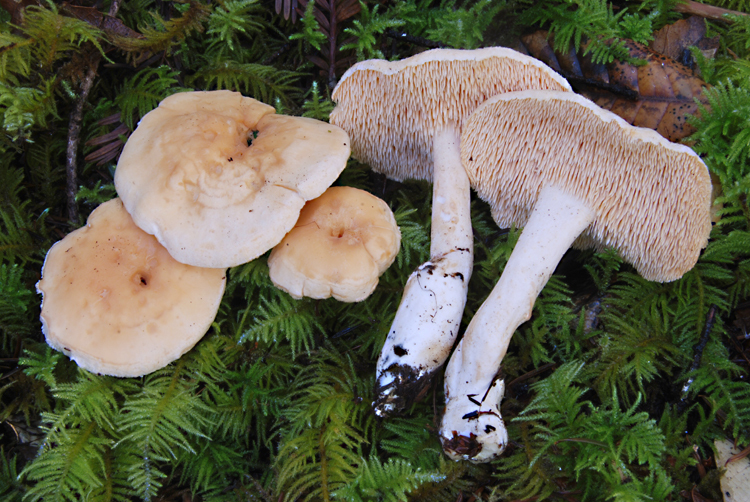 Hydnum fruitbodies are easily recognized by their pale creamy, beige or pinkish fruitbodies with soft spines under the cap and a stringy-fleshy texture. All are ectomycorrhizal, occuring with conifers and perhaps a few ericaceous broadleaved trees. All are edible and highly regarded. All taxa from California are going by European names, and critical comparison is necessary. Two species have been recorded from Santa Cruz, but one of them (Hydnum repandum) has not been found in our county for quite a while. Important identification characters include size and stature, coloration (subtle), and habitat association.